The Cabinetmaker turns your furniture dreams into a custom-made reality. Sometimes your ideal piece of furniture requires a craftsman to design and build it for you. Other times it means you’d like to build it yourself. The Cabinetmaker offers a wide range of service to design and build Arts and Crafts furniture to compliment your home today and pass along to your family tomorrow. If only you could print out your ideas on paper to share with others, and then designing kitchen cabinets and furnishings would be easy. Dale Barnard, The Cabinetmaker, is like a printer for your mind’s eye. Dale listens to your ideas and needs, combined with your dreams for custom made furniture. As a third-generation master woodworker, he turns your thoughts into drawings, materials list and details to breathe life into your custom made cabinets, furniture and vision. Dale’s genius in woodworking produces furniture in Arts and Crafts, Art Deco, Mission, English, Victorian or any style to suit your taste. Register for a lesson to build heirloom-quality furniture. Dale Barnard shares generations of experience teaching you how to make the perfect gift for your family or ornament for your home or workspace. From learning to turn a beautiful table leg to selecting the best wood for your project, he shares tips and insights passed down from his father and grandfather. 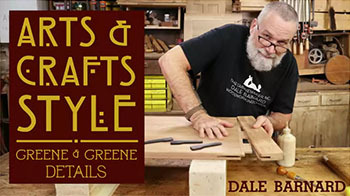 Learning from Dale means you are gathering his lifetime’s worth of woodworking know-how. The information you’ll glean from his background in antique restoration, new art creation and years of experience is priceless in building and construction your own new and unique pieces.